Magnet geography / Coates Bluff Trail, Shreveport, a photo by trudeau on Flickr. 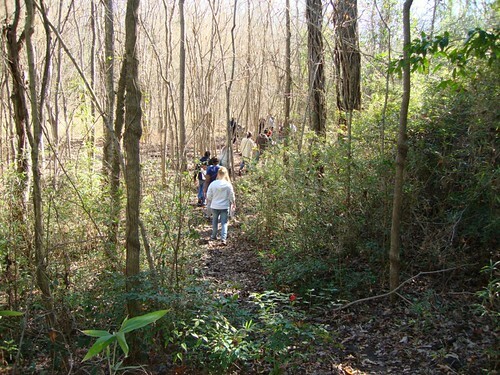 A friend from Salem, OR, came through Shreveport on Tues and we effortlessly hiked the Coates Bluff Nature Trail end to end. It was a gorgeous half-mile. Two improvements have been made to the trail this week. Thanks to a Jon Soul-led work crew on Sat, the auto tire gallery seating has been completed. At this mini-amphitheater near Montesori School for Shreveport, it's easy to imagine students giving brief lectures to each other on the topics of sycamores, native pecans and southern beavers. Near the Valencia / Magnet HS end of the trail, a recent tree fall presented a dual-trunk, stick-studded under-tree challenge. That has been cleared out and it is now an easy dual-trunk underpass. At the Valencia Park end, a softball game was underway between Magnet and Airline girls' teams. The field had been mowed and the Valencia Community Garden was serene. Near Montessori, ducks were playing on the water. Several sub-teen fishermen were learning the art of angling. All in all, this week is the perfect time to make the trek. No poison ivy, no snakes; just tall trees and beautifully calling birds. Begin the trek by parking at either Valencia Park or MSS. You will soon see the entrance to the footpath. Three finalists from the Wideman Piano Competition held in December 2011 walked onto the Riverview Theater stage to solo with the Shreveport Symphony Orchestra Saturday evening February 25, 2012, and came away with Bronze, Silver and Gold medals. Two Rachmaninoff Concertos and one by Prokofiev had audience members jumping up from their seats to give standing ovations. Guest conductor for the program was David In-Jae Cho. 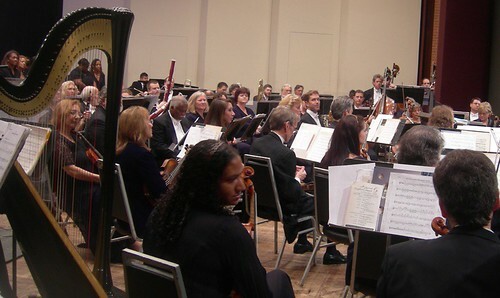 Through some unique camera work with live images projected on a large screen above the orchestra, the audience was able to observe each pianist with an up close and personal view. SSO Concertmaster Kermit Poling interviews the finalists above as the judges tabulate the votes. See you at next year's competition and in the meantime, support your local orchestra and the musicians who make it possible by sharing their talents with you. 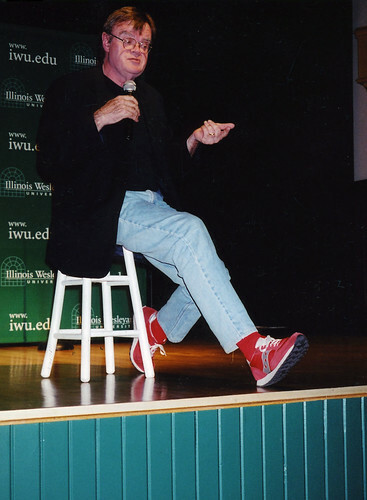 Garrison Keillor, a photo by ISU Milner Library on Flickr. "A Prairie Home Companion" with Garrison Keillor is coming to Shreveport for a live broadcast on Saturday, June 9, at 4:45 p.m, says Kermit Poling. The show will take place in the historic Shreveport Municipal Memorial Auditorium. Tickets are on sale Now and are going fast, says Poling. Tickets prices range from $25.00 to $65.00. A very limited number of $15.00 student tickets are available. The Student tickets are being sold at the Centurylink Center box office and on the day of show at Municipal Auditorium. Alliance for Education, Shreveport: D Scott Hughes, a photo by trudeau on Flickr. The director of Alliance4education.org is D Scott Hughes, a tireless advocate for improvements in Louisiana schooling as well as Caddo schools. Today the Alliance is shaking up Shreveport by developing a proposal that would create 3 school districts from the current Caddo system. The program is Time for A Better Shreveport, a weekly on-air chat with hosts Robert Trudeau, Loren Demerath and Carolyn Manning. William Bill Joyce, Brandon Oldenburg, Moonbot Studios, Shreveport, accept Oscar for Best Animated Short / photo Talbot Hopkins , a photo by trudeau on Flickr. Buster Keaton-like hero recovers from devastation in a healing center that happens to be a library. His pulse and grace return via stories offered by warmly anthropomorphic books. In the 15-minute tale "The Fantastic Flying Books of Mr Morris Lessmore" Bill Joyce and Brandon Oldenburg were able to mash their love of books, of movies, of music and dance, of hearth and family into a wordless tale of the circle of life. On Sun night it was awarded an Oscar as Best Animated Short. Moonbot Studios invested 2 years of long days into the tedious and exacting business of making a seductive animation. Yet recognition for the movie was far from a slam-dunk until Sun night. Joyce knows the sting associated with making a splendid piece of work that does not make a great mark in the market; see the movie Robots as an example. The critics judged it a great animation (Joyce's work) but weak in script. That resulted in a 64% at Rotten Tomatoes. But in the compact Lessmore movie veteran storyteller Joyce controlled the script - wordlessly - as well as the animation. Shreveporters connected by social media yelled across their screens in joy as the award announcement was made. Artist Talbot Hopkins braced her camera against a table and squeezed off shots of the TV screen as Joyce and Oldenburg accepted the golden trophy. 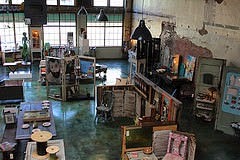 Moonbot Studios, Shreveport, is the creation of 2 forces: the creative team and the bank team of the state of Louisiana. Generous subsidies - so much money that Moonbot declines to comment - empowered the effort. to secure its investments in the movie industry? Will Moonbot be able to capitalize on its big night? Next week, the party over, creative workers will return to the desk and camera across Louisiana. On one shoulder there will be elation and empowerment. 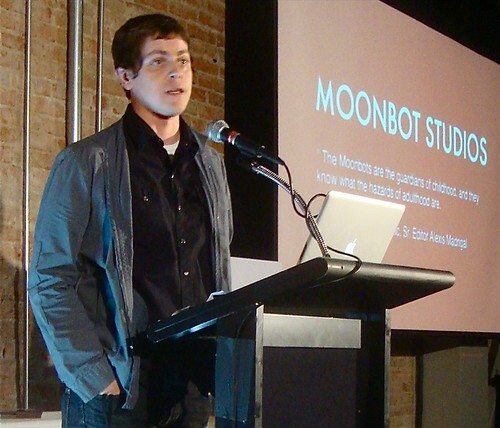 On the other shoulder the weight of responsibility to re-create the success of Moonbot. 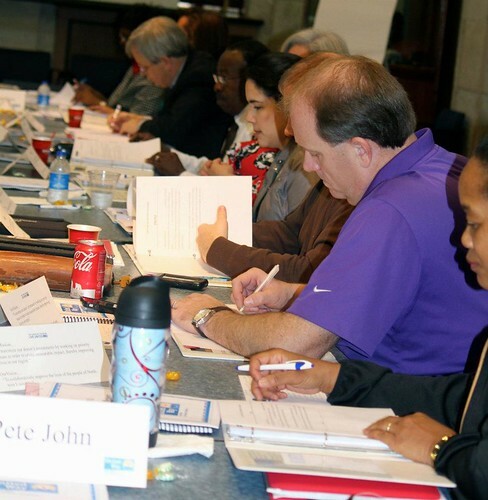 Will the Moonbot plan be a pattern for other Bayou State successes? Take one entertainment veteran, a person with a record of achievement. and add a youthful partner and a hungry team of freshly-graduated workers. None of them afraid of arduous hours. Stir well. Add salt and vinegar to taste. 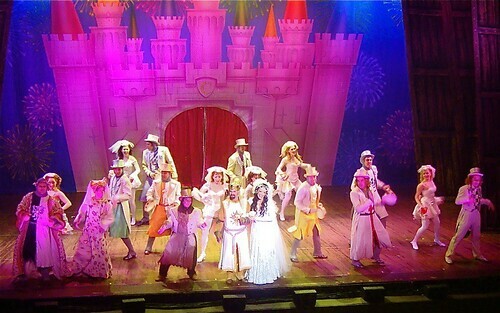 Spamalot @ the Strand Theater, Shreveport , a photo by trudeau on Flickr. Having inhaled Spamalot, the stage version of Monty Python and the Holy Grail, last year at this time there is no hesitation in trumpeting the return of the award-winning show to the Strand Theater on Tues, March 6, 8 pm. There is a tie-in with Robinson Film Center to consider, too: March 2-3, 10 pm, the RFC will present the 1975 British movie, Monty Python and the Holy Grail. Last year we splurged upon the best seats in the balcony. Frankly, it was a feast of color and humor. Money well spent. 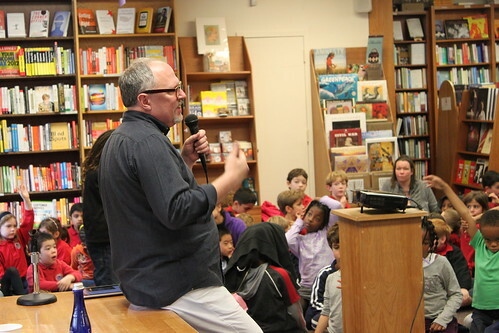 William Joyce, The Man in the Moon, a photo by Politics and Prose Bookstore on Flickr. Asked by ABC news to produce a 3-word response to their Oscar nominations, the Moonbot Studios team animated a clever presentation - demonstrating their shop's chops. See it about 2:57 in this clip. SSO, a photo by trudeau on Flickr. Exciting camera work will bring the audience into the action as up-close images of the musicians are projected on the walls, says Lois Robinson. A free ‘Inside the Music’ pre-concert conversation takes place at 6:30 PM in the Riverview Theatre. Loren Demerath, Vincent Williams and TJ, a photo by trudeau on Flickr. Viola Liuzzo was a Unitarian Universalist civil rights activist from Michigan, says Wikipedia, who was murdered by Ku Klux Klan members after the 1965 Selma to Montgomery marches in Alabama. Extensions Of Excellence Performing Arts Inc. presents a drama on Liuzza's life called "THE MARKER" on Fri, Feb. 24, at 7:30pm in the Scottish Rite Temple Theater, 725 Cotton Street, Shreveport. The play was written by David Barr and is being directed by Vincent Williams. Liuzzo's name is one of those inscribed on a civil rights memorial in the state capital. She died at the age of 39. 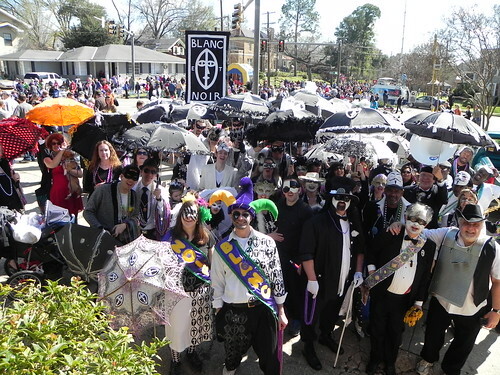 Blanc et Noir Marching Society 2012, Shreveport / photo Marion Marks, a photo by trudeau on Flickr. LeVette Fuller, Dr Emma McCarty and Matthew Linn will answer questions about all things Krewe of Highland on KSCL at 5 pm Mon, Feb 20. The Krewe's Bal Masque, the massive parade, the past and future of Highland neighborhood will be up for discussion. Extensions Of Excellence Performing Arts Inc. Presents, "THE MARKER" Written By: David Barr & Directed by: Vincent Williams. 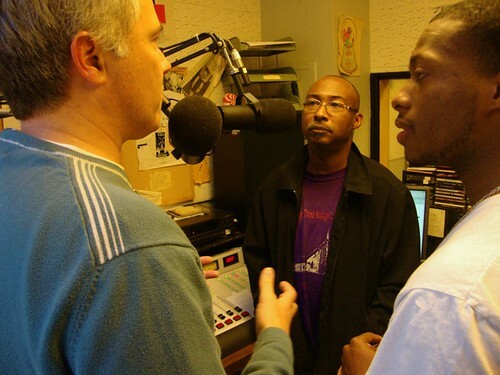 The program, a regular weekly show, is Time for A Better Shreveport. TEDx RedRiver Region - Brandon Oldenburg, a photo by trudeau on Flickr. The Krewe of Highland Parade's Grand Marshall is Moonbot Studios' Brandon Oldenburg. It's a smart call for Shreveport's Mardi Gras. Oldenburg and Moonbot partner Bill Joyce have been nominated for an Oscar for their animated short, "The Fantastic Adventures of Mr Morris Lessmore." If you check out Oldenburg and the uniform being worn by the riders on the Moonbot Studios float in the Krewe of Highland Parade you will see black coveralls made by Dickies, the classic American jeans company. Therein lies a tale of the media flash world of an Oscar nomination. When Oldenburg was interviewed last month by Dallas Observer movie critic Robert Wilonsky, the journalist ended his column thusly: "Now, there is but one question on Oldenburg's mind as he prepares for the Oscar ceremony next month: "Who am I wearing?" He laughs. "Any Dallas designer, call me. I'd be happy to entertain it. Dickies is out of Fort Worth, aren't they?" Following that blog post, Dickie's contacted Oldenburg and Joyce and have designed Oscar-ready tuxedos for the satire-minded duo - already notorious for photo-bombing an early Oscar nominee group shot. Using Dickie's master tailor and fabric, the Ft Worth-based company has custom-designed not only tuxes for Hollywood appearances, but also suited up the Moonbot Studios parade riders in Dickies coveralls, says Oldenburg. "Growing up in Ft Worth I passed the Dickies factory all the time," said Oldenburg. "Today this company is suiting up skateboarders and rock bands." And Oscar nominees and Mardi Gras float riders in Shreveport's neighborhood Krewe of Highland parade. Highland parade rolls #mardigras #kreweofhighland #louisiana #shreveport #kathrynusher, a photo by Kathryn Usher on Flickr. 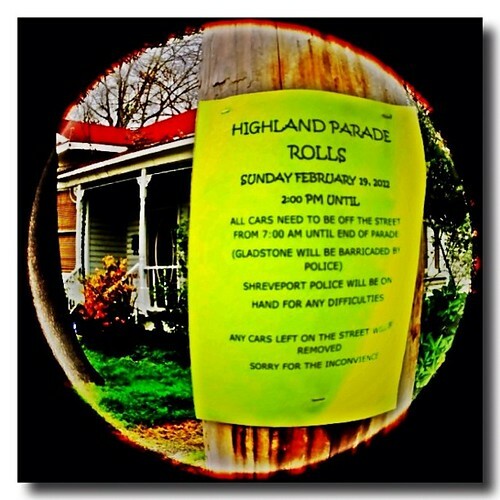 Krewe of Highland Route: the parade assembles in the Byrd HS area along Creswell. The beginning of the parade is basically Creswell at King's Hwy. The assembled masses roll north on Creswell at 2 pm. At Herndon the paraders go east and head to Highland Avenue; turn south and go to Olive; turn on Centenary Boulevard and head south past Kings Highway. It will continue on Gladstone before ending at Creswell Avenue. After the parade, there will be the Carnival de Columbia in Columbia Park, which is located at Columbia Street and Line Avenue. Expect the fabulous reggae band called Stiff Necked Fools in the park. Krewe of Highland Bal Masque on Fri, Feb 17, 7 pm to midnight, at Randle T Moore Center. Tickets $45 at door. Mask and costume required. If you'd like to march in the parade, please consider joining Blanc et Noir Marching Society, a gang of second liners accompanied by the Red & Black Brass Band of Grambling, La. See more here. Will the Super Water Sympathy "Slade was made" film by Mindy Bledsoe win the Louisiana Film Prize? Glenn Prickett during his speech, a photo by Marriott International on Flickr. "Conservationists have often viewed the business world as an adversary," says Conservation International (CI). "Glenn Prickett doesn’t see it that way." Prickett, senior vice pres at CI, visits Centenary College this week. 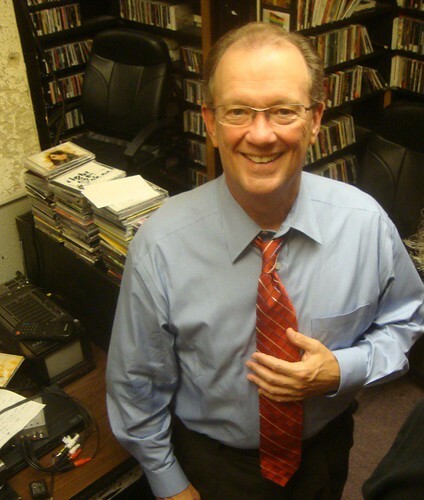 He will chat on-air Mon, Feb 13, at 5 pm, on KSCL, fm 91.3. The program is Time for A Better Shreveport with Loren Demerath, Carolyn Manning and Robert Trudeau. CI continues, "What if the very same power that makes business a formidable opponent could be used as a tool in biodiversity conservation? And what if an environmentally sustainable approach to business could give a major boost to the bottom line? It’s a fundamentally new approach to both business and conservation, and the results might just change the world. Changing the world is what Glenn Prickett does. As the head of CI’s Center for Environmental Leadership in Business, Glenn creates and develops synergies between the business and conservation arenas." 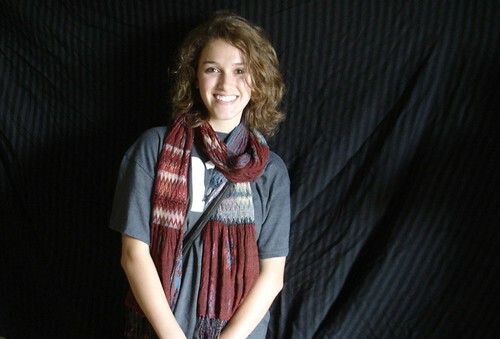 Bailey Anglin, Shreveport, a photo by trudeau on Flickr. For modern dance in an intimate setting see Louisiana Dance Theater's 2012 Regional Dance America event on Sun, Feb 12, 7 - 7:45 pm, says Carol Anglin. Some 9 pieces will be performed by Anglin's company, Louisiana Dance Theater. The young teens of LDT will share the spotlight with Bailey Anglin and partners from the Kirov Academy of Ballet, Washington, DC. "Meet the choreographers and dancers in the reception immediately following the performance," says Anglin. No Charge for admission; tax-deductible donations appreciated! Full disclosure: I am a strong and unwavering proponent of public education. I always have been, and I always will be. That doesn't mean I support the existing Caddo Parish public school system - I do not - and it doesn't mean some other model can't work for some children and their parents. It means that I've learned we would be very wise not to sell the family (education) farm to the prevailing political windstorm. Every child, and every good and faithful-to-our-children educator on the front line - teachers, in-school administrators, and all their required support personnel - deserve protection during this storm. The Louisiana legislature will convene in a month or so to take up Governor Jindal's education "reform" package. All public education as we have long known it will enter that fray as a seriously endangered species, even in school districts where it is functioning very well. Attacks on public education will be wrapped in all manner of flag-waving rah-rah, but I urge you to listen carefully during those pep rallies for what you do and, more notably, DO NOT hear. -- When these cheerleaders say "private and parochial schools," many are winking and nodding and grinning at one another. A simple question must be answered: what part of "private and parochial" is actually for-profit private schools? If this entire deal is really, as some believe, about diverting state taxpayer dollars from the public education Minimum Foundation Program (MFP) into the pockets of profiteers, we need to know that. "For profit" is anything but evil, but it belongs in some endeavors and not in others. -- When we hear a discussion of "accountability," we should listen carefully, and then note that the Jindal plan does NOT include accountability for the for-profit private schools. Those schools, somehow, don't require the oversight that public schools do. Gov. Jindal was recently outed on this point: read a very important article from Mike Hasten with Gannett News here. -- When these folks - who are, we must remember, riding a wave of relatively uninformed public support - talk about "charter schools," we must listen carefully to see if the ones referred to are the not-for-profit version. Anyone, after all, can call anything, anything - as we constantly see in the media and culture. There's always a reason to call an industrial drainage ditch a "creek" and that deliberate misnaming is almost always an attempt to sell us something we don't want or need. -- When we are told by these politicos - many of whom are only passing through Louisiana, longing only to be in Washington, DC - that all of this is only about "school choice," we must be careful to hear which education models are, and are not, included in the list of "choices." Independent, community school districts - as are operating successfully in East Baton Rouge Parish - are not "choices" we are hearing from the political promoters of the governor's package. Is it a "choice" when the full might of a state government ignores it in their sales pitch? -- When the subject is "teacher unions," some educators are, and others are not, union members. An article by Morning Advocate education reporter Will Sentell is helpful (see article here). Members of the Louisiana Federation of Teachers are real and true labor union members, and some other educator groups are "professional employee organizations." In my home, Caddo Parish, a group of public education devotees are working long and hard hours to replace our failed public school system with independent - or "community" - school districts. It took the teacher union about a half-second to attack this effort without so much as a clue about what the proposal might ultimately include. Likewise, certain people who can only support "their" school are primed and ready to kill the entire effort if "their" school isn't going to end up precisely as they want "their" school to be. Success is a long-shot, but when and if we gain the support of representatives of all communities, then go forward with this plan, we will welcome all questions. (1) There are hundreds of millions of dollars per year up for grabs here. Most of that now goes to public education, and all of that is highly lusted after by beaucoup people, many of whom aren't even in Louisiana. (2) When our governor told us he had "reformed" our governmental ethics system, he actually did just the opposite, gutting enforcement, and rendering the entire system an ineffectual embarrassment. He did that so a double-handful of folks he needed to handle his stuff in the legislature would thereafter do as he said. Each of them had "issues" with ethics complaints against them, many of which were active at the time. Our governor was a hot national political property, and the deal he cut was - in his mind - a key to his chance to be on his party's national election ticket. Each time we buy into in the "hottest" political schtick out there, we get burned. This time, our children are the ante and the bets in this political and money game. That mean's it's no game. That means we must question everything we are being told, and demand answers to everything the political spinmeisters and profiteers don't want to answer: E V E R Y T H I N G .
If you'd like to subscribe to Stonecipher's commentary, send an email request to him at evetsmanagement@msn.com. Untitled, a photo by RStuart-Haas on Flickr. 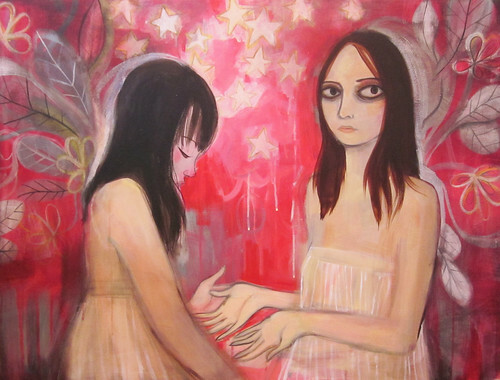 Artspace Shreveport will open a show of paintings by award-winning artist Rachel Stuart-Haas on Fri, Feb 17, 5 to 8 pm. "If your invitation says the reception's on Thurs, please be aware that it's on Fri," says the artist. 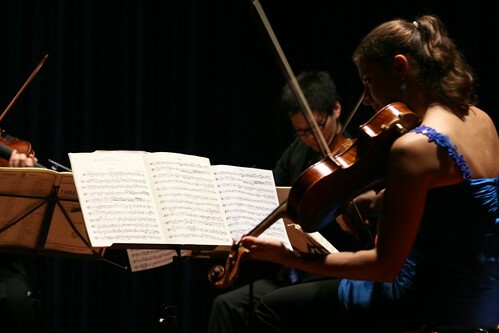 ERF 2011 - Old City String Quartet, a photo by Emilia.Romagna.Festival on Flickr. The Old City String Quartet will be presented in a free concert on Fri, Feb. 17, at 7:30 in Anderson Auditorium at the Hurley School of Music at Centenary College, says Laura Crawford. The group is the top young string quartet in America, having just recently won the Fischoff National Chamber Music Competition Grand Prize. They are 2011 graduates of the Curtis Institute of Music in Philadelphia and are currently the Quartet in Residence at Rice University. Their recent CD on Unipleye label won the Blue Moon award and was reviewed in STRAD international magazine. The group will perform quartets by Mozart, Schumann, and Debussy. On Sat. a 1:00 there will be a shorter informal concert geared to a younger audience and will include a question and answer session. Tom and the Cats playing the C. E. Byrd High School junior prom held at the Washington-Youree Hotel in Shreveport, Louisiana (Gusher [C. E. Byrd High School yearbook], 1966). Shreveport music matters on KSCL, fm 91.3, Mon at 5 pm: Jim Huckabay on the House Concert Series and Alan Dyson on his new tune andvideo, "Louisiana Jive"
Jim Huckabay, a photo by oneeyeddogblues on Flickr. The House Concert Series, acoustic Americana performed at Fairfield Studios, has been a part of Shreveport since 2004. 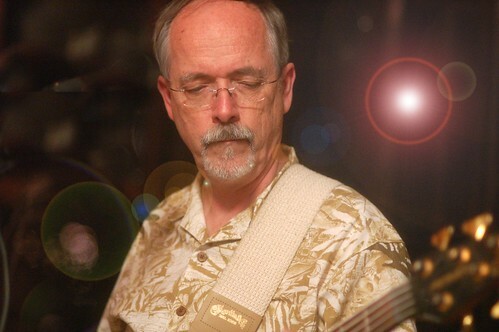 Musician / producer Jim Huckabay chats about the history and future of the House sessions on KSCL, Mon, Feb 6, 5 pm. Also on the weekly program Time for A Better Shreveport: singer-songwriter Alan Dyson has released a politically hot tune and uptown video called "Louisiana Jive." Dyson will be joined by co-writer Debbie Engle and video producer Marion Marks. Hosts of the show are Robert Trudeau, Loren Demerath and Carolyn Manning. Stream the session at Kscl.fm. Huckabay photo by Barbara Beaird. 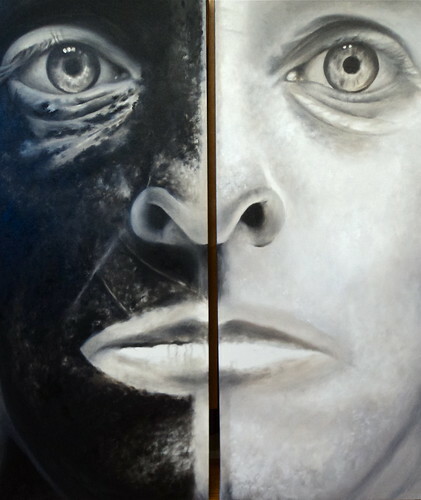 "L'etranger", diptych , oil on canvas, Talbot Hopkins' Painting for Artport 2012, Shreveport, a photo by trudeau on Flickr. An exhibit of over 90 local and regional artists' work has been installed at Shreveport Regional Airport as part of the Airport Authority's 60th anniversary celebration, says Mark Crawford. The reception is Thurs, Feb 9 from 6:00-9:00pm. Free admission; validated parking. As one of the only revolving public art displays located in an airport setting in America, more than 1,000 people are expected to attend. The 2012 show is the fourteenth installment at the airport. A silent auction of artists and celebrity art tiles benefits the Deaf Action Center. Artport will occupy the bottom floor and upper atrium area of Shreveport Regional Airport for the evening. Live entertainment by The Matthew Davidson Band from 6 - 9 pm, hors d'oeuvres and a cash bar. 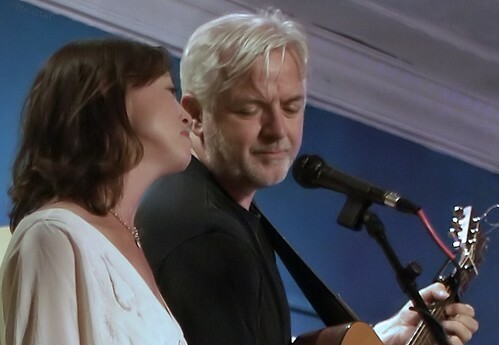 Bill Isles in Concert, a photo by Doc macaSTAT on Flickr. The show goes on at Fairfield Studios—this month with a couple from Minnesota: Bill & Kate Isles. Make room in your week, says Jim Huckabay, for this intimate Sunday evening show, next Sunday, Feb. 12. Reserve now at www.shreveporthouseconcerts.org, by email: reservations@fairfieldstudios.com or by phone: 318 219-7688. Sunday, Feb 12, 7 pm at Fairfield Studios, 1510 Fairfield Avenue, admission $20 (cash only, please).